Sony (Ericsson) Xperia arc and Xperia neo owners can rejoice, the Android 4.0 Ice Cream Sandwich update has started to become available for these handsets. The phones will be updated to Android 4.0.4 and will remain on kernel 2.6.32. If you’re eager to find out whether your phone has been updated keep an eye on the Talk Sony Mobile forums. Xperia arc owners will find out which SI numbers have been updated here, whilst Xperia neo owners can look here. Other 2011 Xperia handsets should see their ICS updates rolling out very shortly. The Android 4.0.4 firmware is also hitting the Xperia arc S, Xperia neo V and Xperia ray. These handsets were previously running Android 4.0.3. 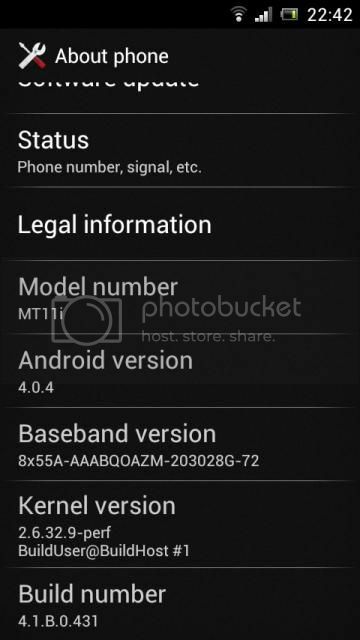 One of our readers sent a screenshot of the Xperia neo V that shows it has been updated to firmware build number 4.1.B.0.431.